Editor’s Note: I’ve decided to begin posting some reviews of films screening at Hot Docs 2009 early, hopefully helping anyone attending make some decisions about what to see. The Tiger Next Door is screening on Friday May 8 at 10:00pm at the Royal Cinema and Sunday May 10 at 1:30pm at the Bloor Cinema. The Tiger Next Door (Director: Camilla Calamandrei): Beginning with the rather shocking assertion that there are likely more tigers in private captivity in the US than there are left in the wild, The Tiger Next Door introduces us next to Dennis Hill, a man who keeps 24 of them on his Indiana farm. A former meth addict, the wild-bearded Hill seems to scare and charm his neighbours in almost equal numbers. 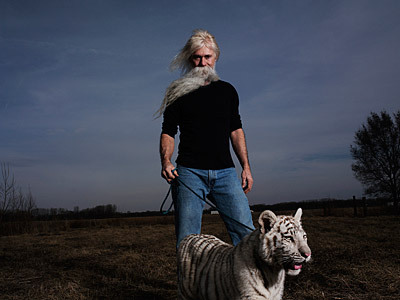 Like many other obsessive animal lovers, he started with just a few big cats on his property, but his desire to collect and even breed more exotic animals soon leads to a situation that could end in tragedy, either for the animals or for the local populace. In classic libertarian fashion, Hill decries any attempt by the government to regulate his operation, but after more than twenty years, the Indiana Department of Natural Resources finally conducts an inspection and gives him 30 days to get rid of all but three of his tigers. The bulk of the film follows his efforts to both find homes for his cats and to make the required changes to his cages so that he can keep some of them. Hill seems like a decent enough man, gentle with the animals and content to mind his own business. But he seems to pay little attention to the concerns of his neighbours, and continues to breed tigers to raise money to pay for the upkeep of his menagerie. Throughout the film, Calamandrei weaves news footage of tiger attacks and talking head interviews with both government officials and operators of rescue organizations who are critical of the idea of private ownership of these animals. The tension between the dangers (and possible cruelty) of keeping tigers as pets and the obvious love Hill has for his animals keeps the film in an interesting balance until near the end, when two conflicts erupt. The first occurs when several of the tigers begin to grow anxious as they’re being taken away by new owners. One paces her cage relentlessly, while another throws himself at the fencing in his cage until it begins to give way. Even the new owners seem a bit spooked, and we’re quickly reminded how wild and powerful these animals really are. The second conflict is between Hill and the owner of a rescue organization who has taken in a number of Hill’s animals over the years. Even after taking in yet another of his tigers, the man clearly dislikes Hill, and a tour of the rescue facility with the two men quickly descends into a bitter argument. Suddenly, Hill’s motives and ethics don’t seem so clear. Strangely, the film ends on a note that is both uplifting and chilling, as Hill vows to continue pursuing his dream of breeding a stripeless white tiger. His conflicts with people only seem to make him more determined to surround himself with animals. For most people, this would be harmless, but for Dennis Hill, only time will tell. There is one point in the film where the chronology becomes a little confusing. We observe a public hearing into whether Hill will get his permit, at which his neighbours speak out for or against him, but at the same time the film is intercutting scenes of him preparing to move animals out to new owners. It’s not clear for a while that Hill is present at the hearing, making it appear that the two events might be happening at the same time. Eventually we realize they are not. Apart from that sequence, the film is well-edited and paced. Calamandrei has uncovered a story that not many people have heard before, and tells it well. This entry was posted in Documentaries, Film Festivals, Hot Docs and tagged #hotdocs09, conservation, wildlife. Bookmark the permalink. i saw the film and it was excellent!the only problem is it is very deep and wide, 87 minutes to cover a 25 years plus of my life and all the other people involved, and why the say the things they do.yes, i used to be rich and a paycheck every week until our wonderful goverment let all our jobs go to mexico, and this is when the problems start.the bank lied and wanted everything i owned, and i was just in awe about that. i believe in integrity,truth,respect and brotherhood!too many things went wrong, i did smoke meth and ended up getting in trouble. they did not get me properly and was very unethical. but i accepted 3 years probabtion because i wanted away from the drug, and i did get away.but because of this case, i was on cnn, and the usda had not been at my house for 1 1/4 years. they were called out and wrote me up for all kinds of things, things that were not right, but they were under the scope. all my cats were top shelf shape, it was i that wasn’t! long story short here, i took a suspension in aug 2005. prior month, july 2005 ni went to court to get my property returned that had been taken by feds. well, i made waves. aug 30 dnr came in during the rains from katrina , climbed on my tiger cages,causing them to spook and took pictures of them in the mud, and tried to take them from me. i have always been notoriously known, mostly all in a good way. they had people they were gonna give me cats to that they didn’t know what their integrity was. i hand raised every one of them, still had the first cat i ever got,had her for 21 years, marci cat,R.I.P my baby,! those tigers suffered mentally when they had to leave me, and i still think everyday about them. i had 5000 signatures against them, and it doesn’t matter where i go, someone always comes up to me and tells me how wrong they have done me.joe taft, the man i got into the argument with, there is a special section in my book for him under the heading, liar,liar, pants on fire! he came to my house in 1994 with one cat, a spotted female leopard with her teeth busted out, wanting to breed her. it didn’t work out and he left mad. but for years he has been telling everyone he has rescued cats for 35 years, hah! he tried to get my cats and wanted the state to pay him 40k, ans he could have trophys to tell everyone ,yes, these came from dennis hill’s. taft tells lies for money, you’ll have to read the book. i did breed tigers, but it was with the theory of the greater gene pool diveresity, to arrive at rare colors. honestly though i have only sold about 12 tigers, i kept the others here. there is so much that is yet to come. realistly and truly my story is one of being different and becoming a target for that. it has benn “open season” on me, for these people to finally get a chance to say anything they wanted about me, whether it be speculation or non truths in any form!i can only tell you that for 25 years i have given everything to my animals,blood,sweat,tears,sold,borrowed,stole and maybe even lied fore them. and i you can tell by the way i talk to them and they talk to me in this movie. all i can say is theer is a lot more to come. my book,”NO TIGERS ALLOWED”,”THE LIFE,””THE CONTROVERSY,” and “THE CONSPIRACY” will blow you away. i stand up for what i know is right, and i am still standing here with tigers on my right and tigers on my left, after 3 bankruptcy filings, one federal raid, one dnr raid, 4 us fish and wildlife hearings, 1 documentary, several newspaper articles (mostly good after the truth got out……..but i have paid a lot of extra dues and died a thousand deaths, because it is true…….there are 2 sets of rules in this world and the most dangerous animal in the world in man! I am excited to see what they made here. I know Dennis and I know he respects all animals and does everything he can to help whenever he is needed. He is one of the smartest and most interesting people you’d ever get the privilege to meet and all of us need to listen when he speaks. He is one of the few ‘animal’ people who speaks that universal language. He is very responsible and humble and takes care of the things he loves. I think his love of his animals could even go so far as to be stronger then some people have for their own house pets, and his tigers know it too.